Halloween can be a fun time of year for the whole family – even your dog. However, there are also many potential dangers and sources of stress for your dog. Just remember to keep your dog safe from these Halloween hazards. Remember that human treats are not usually good for dogs! 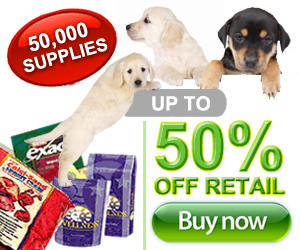 Candy – especially chocolate – can be extremely toxic to your dog. Artificially sweetened candy, gum and other goodies may also contain xylitol, a highly toxic substance. Dogs may also ingest food wrappers, causing a risk of choking, upset stomach or gastrointestinal blockage. 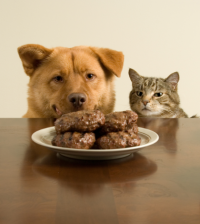 Various party snacks can be too salty and may contain ingredients that can poison your dog. 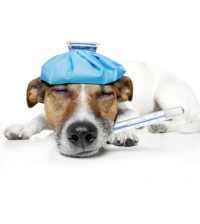 Alcoholic beverages and dogs do not mix – they pose a significant risk of severe illness or even death! Keep all of these “human goodies” far out of your dog’s reach. If you are not positive that you can keep your dog away from these hazards, then consider confining your pet to another area of your home during the festivities. Keeping appropriate dog treats around for your dog can be a great idea, but remember not to overfeed. Sliced carrots or apples (hold the caramel) can be tasty and healthy snack alternatives for people and dogs alike! Your dog is bound to be curious about new objects around the house, and that includes Halloween decorations. Be sure decorations are not in areas where your dog could ingest them or bump into them. Power cords trip your dog or lead to electrical shock if chewed. Be careful with the placement of jack-o-lanterns – have you ever seen a dog eat a whole pumpkin? It is not pretty! Also, candles can be knocked over, potentially burning your dog and/or starting a fire. Other decorations can be eaten or broken, causing serious harm to your dog. Have fun and decorate – just think about your dog first! Though many dogs love visitors, some can become fearful of strangers. Many dogs will even be afraid of people they know if those people are in costumes. Plus, constant ringing of the doorbell might get your dog over-excited or very stressed out. Think about your dog’s typical reaction to visitors and take extra precautions for Halloween. Keep your dog at a distance when greeting trick-or-treaters by putting up an baby gate or confining her to another area of the home. When inviting guests into your home, introduce them to your dog in a positive manner. If your dog seems afraid of guests in costumes, remove her from the situation calmly. During parties and loud gatherings, your dog might do best in another area of your home unless she is used to these types of events and has done well in the past. Some dogs really enjoy getting dressed in costumes – they might ham it up and revel in the attention. Other dogs can become scared or uncomfortable in clothing of any type. If you want to dress your dog up, start simple and see how she handles it. If she does not like it, then don’t push the issue. Try a Halloween bandanna or collar instead. If your dog does seem to enjoy getting dressed up, be certain you choose a costume that fits comfortably. If it is too tight, it could cut off circulation or cause sores to develop. Loose-fitting outfits can trip your dog or get caught on objects around the house. Because of these potential dangers, never leave your dog unattended in the costume. She could become injured or may ingest parts of the costume and choke, become sick, or develop gastrointestinal blockage. I personally feel that unsupervised dogs are best kept indoors year-round, though some dogs will do fine living outdoors alone. However, the rules are different during the Halloween season! It is extremely crucial that you keep your dog indoors unless directly supervised. Sadly, there are cruel people who have twisted ideas of fun this time of year – and your dog can be the victim. Though it is more widely know that black cats are targeted during Halloween, any household pet can be at risk and MUST be kept indoors! Your dog can be part of Halloween fun if you play it safe. As always, follow common dog safety rules: be certain that your dog wears current identification at all times, keep your dog on a leash when outdoors, and keep her safe from potentially dangerous situations. 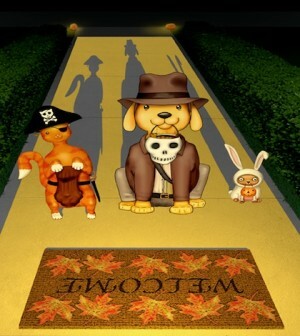 Have fun, be safe and have a happy Halloween!